Today was a day of very hot temperatures across much of Metro Vancouver, except places right by the harbour such as Waterfront Station. Therefore, Hapa Izakaya (Coal Harbour) became my choice for dinner tonight. Hapa Izakaya is situated right above the Waterfront Centre food court and is a large restaurant with a patio and clean, modern decor. I came into the restaurant just before their Hapa Hour ended, so I was able to try some items from the Hapa Hour menu as well as other items from the standard dinner menu. The Hapa Hour menu consists of select items from the regular menu at a 50% discount, so I was quite surprised to see that there was nearly nobody seated inside the restaurant. I then turned my head around to see that the patio was completely packed. Nonetheless, I stayed inside the restaurant to benefit from the air conditioning and the more attentive service that comes from sitting inside a restaurant. Also, you can get better photos from the reduced sun glare! After a wait that was shorter than the time it took me to decide on what to order, the Ebi Mayo arrived. The Ebi Mayo came with six lightly battered tempura prawns and one prawn cracker. 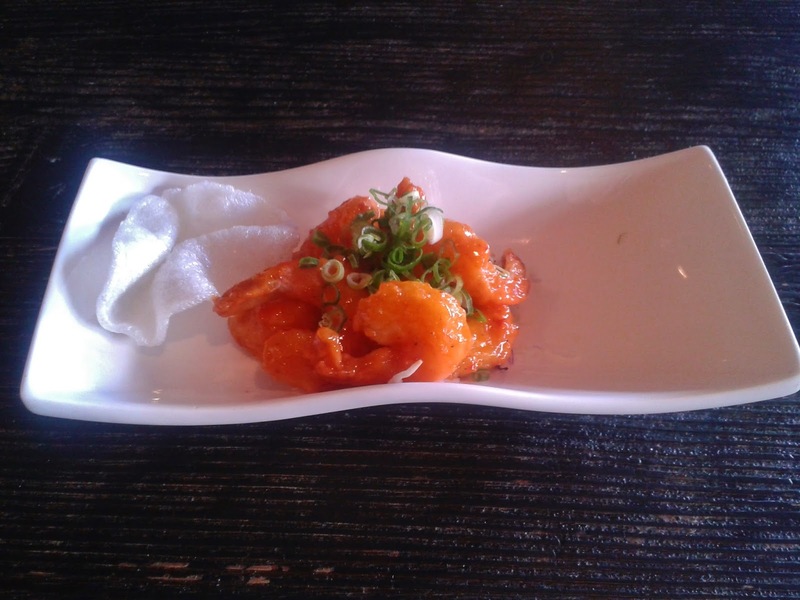 The prawn cracker was crunchier than any of the prawns, which were coated with a very soft layer of batter. The prawns were dressed in a very tangy mayonnaise sauce and served fairly hot. I highly appreciated the uniqueness of the sauce, which left me wanting more of the prawns. This dish was a very good deal at $4.49, but would be rather expensive if ordered at the regular price of $8.99. 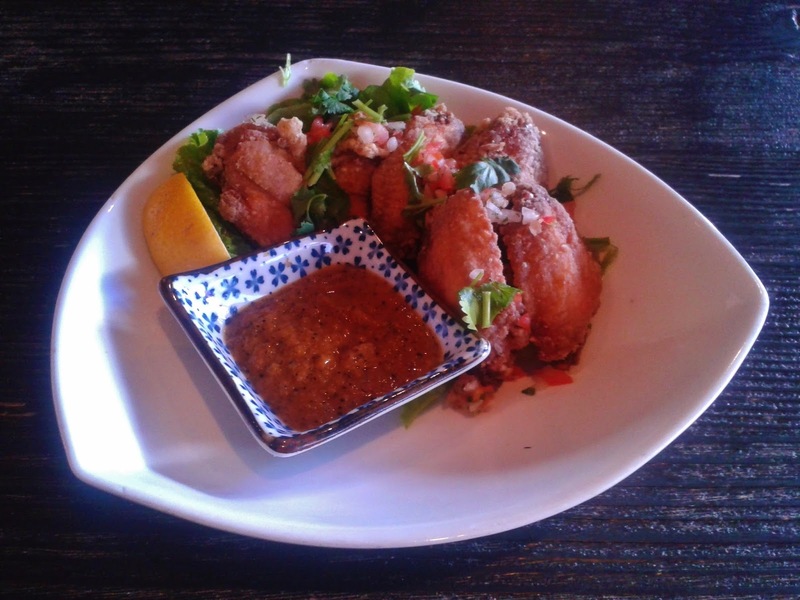 The Hapa Hot Wings had no trouble in maintaining the level of quality established by the Ebi Mayo. The four chicken wings and two chicken drumettes covered with a lightly fried coating and tastefully peppered with spices. The outside was rather dry, but the chicken inside was remarkably tender and juicy. The spicy serrano chili sauce was sweet, tangy and quite spicy, and has an espresso-like aftertaste (yes, the coffee). The sauce adds a sweet and spicy zing to the chicken and goes well with the auxiliary vegetables as well. The Hapa Roll consists of torched salmon, spicy mayonnaise, avocado, cucumber, carrot, asparagus, kaiware (radish sprouts) and ikura (salmon roe). The interior of the roll had a rather solid texture due to the asparagus and the carrot, though these were softer than you would expect. The avocado was the spotlight of the roll, though you could taste most of the other ingredients as well. The spicy mayonnaise on top, when torched along with the salmon, brought a brilliant, charred flavour to the roll that I always look for when I order seared sushi. Unfortunately, there was way too little of this goodness. It was as if the cook was trying to tell me, "I know how to do it right, but you're only getting a little glimpse of my mastery." 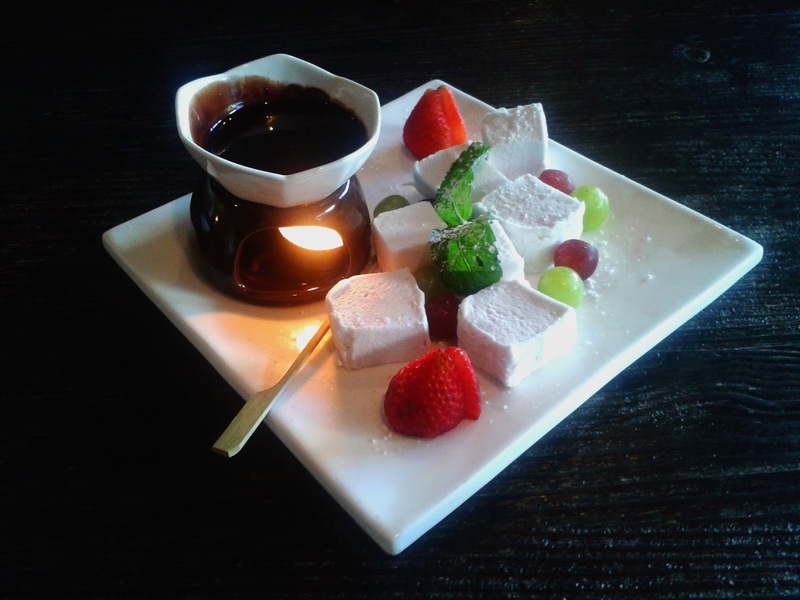 In terms of presentation, the Marshmellow Fondue (it's spelled that way on the menu) was simply glorious. It was in fact eye-catching enough to attract the attention of the tables next to me. The dark chocolate fondue, which was rich and creamy, was kept in a bubbling motion due to the heat coming from the candle below. The marshmellows themselves were amazingly soft and the fresh fruit, especially the strawberries, were very delicious upon being dipped in the fondue. The chocolate was slightly sticking to the roof of my mouth and my lips. It is best to share this dish with at least one other person (or otherwise, you might experience sweetness/chocolate overload ...). Overall, I found the service quite attentive (partly due to the fact that I was one of the very few people sitting inside). Presentation was superb for each dish and the food displayed innovation and experimentation. The items on the Hapa Hour menu are literally a steal, but if you want to try the regular dinner menu (which has a much wider selection as well as higher prices) as well, go at around 5 p.m. and wait until 5:30 to order off the regular menu.